It was a perfect summer evening in the Berkshires for an annual highlight of the busy summer season. For many in the packed Shed and on the well populated lawn Tuesday was a work night. But the festive mood felt more like the weekend. Indeed it was a long evening ending around 11 PM with the tradition arsenal of fireworks accompanying the climax with a massive performance of Tchaikovsky’s energizing 1812 Overture. It evoked Moscow’s triumphant church bells and the thunderous boom of Napoleon’s captured canons. As befits Tanglewood on Parade during the two part program six conductors marched across the stage to take up the baton. Actually, Keith Lockhart, who took two turns including the closing 1812 Overture is more of hands on conductor. 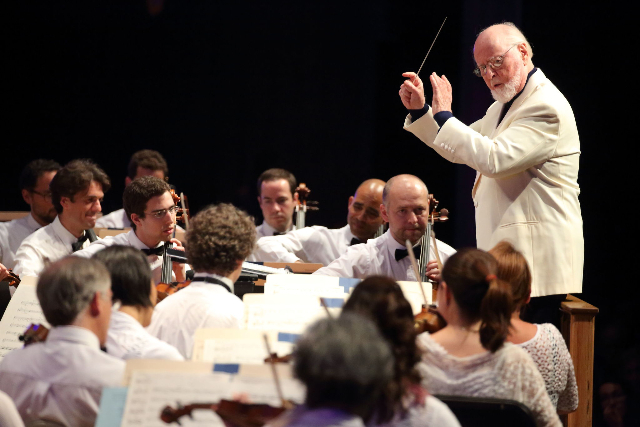 The emotional highlight of the event was the appearance of the venerable John Williams. Before a note was sounded there was a standing ovation for the beloved composer and conductor. In addition to the musical chairs of conductors a primary attraction of the program is a number of short and pithy pieces. There is enough variety to appeal to an audience with a range of interest and musical taste. Bookending the evening the concert began and ended in the familiar manner. There was the brief and richly humanistic familiar opening refrain of Aaron Copland’s accessible Fanfare for the Common Man conducted by Ken-David Masur. Sticking with Copland, Bramwell Tovey, was brought on to conduct the youthful Tanglewood Music Center Orchestra in Concerto for Piano ad Orchestra. It had a modernist, experimental feeling exploring andante sostenuto, and molto moderato- allegro assai. The catchy, accented rhythmic passages contrasted with lyrical one. There was interesting playing in the young percussion section. The baton was passed to Charles Dutoit who finished the first half of the program with suite from Hary Janos by Kodaly. It is a richly descriptive piece. The second part of the evening began with Moritz Gnann conducting the BSO in The Hebrides by Mendelssohn. Celebrating the 100th anniversary of Ella Fitzgerald Lockhart conducted two Nelson Riddle arrangement of Gershwin performed by Dawn Upshaw. The vast audience was massively enchanted by the excerpt of Williams film scores. His annual Film Night is another longstanding Tanglewood highlight. Both orchestra were brought back on stage for the 1812 finale. It never ceases to amaze that they put more than a hundred musicians on stage. The sky was richly lit up as we made our way back through Lenox.